Managing the emotional upheaval and stress of divorce is especially overwhelming when you’re also trying to support your children through the transition. While you may feel stressed by the many logistical, financial, practical and emotional issues you’re facing, your children may simultaneously be struggling with their own conflicting emotions. The stress that results can make daily life enormously challenging. Given what a widespread and complex topic divorce is for parents and children alike, The Tapping Solution for Parents, Children and Teenagers takes a look at several stories of how parents have used Tapping on themselves, and then introduced Tapping to children as a way to process and release their many emotions. I urge you to read this book if you’re working through divorce in your personal life and would like the tools to support yourself and your family. To begin, let’s take a look at how you, as a parent, can use Tapping to move through the process with more ease and grace. After Marta and her husband finalized their decision to separate, she knew it was time to share the difficult news with their 3 children. Their dad would move out of the house soon, and the children needed to know what was happening. On the afternoon when she’d planned to give them the news, however, Marta felt so anxious that she began to feel physically ill.
Recognizing that she needed to calm herself first, Marta closed the door to her room and began Tapping on her panic and nausea, as well as her fear and worry about how her kids would react. She also did some Tapping on a seizing pain she was feeling in her back, along with her intermittent dizziness and a swelling sensation in her throat. Once her panic as well as her emotional and physical symptoms had subsided, she felt calm enough to begin thinking about what she would say to her children. As she continued Tapping through the points, she practiced what she would say, how she would say it, and in what order. She also tapped on the anxiety she was feeling about the questions they might ask her, and whether they would blame her for the separation. An hour later, Marta emerged from her room feeling relatively calm and confident. She then sat down with her children and gently shared the news with understanding and compassion. To her surprise, she didn’t feel overwhelmed by her own emotions. Instead, she was able to be present for them during these difficult moments. She listened to them speak, soothed them as they cried, and was able to support them in every way she could without feeling any emotional backlash of her own. Thanks to Tapping, Marta was able to give her children what they most needed—her full presence. Let’s take a look at how you, too, can use Tapping to feel calmer and more present when you share the news of your divorce with your kids, as well as family and friends. To begin, find a quiet space where you will be uninterrupted, and take 3 deep breaths. Focus your attention on sharing the news of your divorce with your children. As you think about it, do a mental scan of your body, and notice how different parts of your body feel. Is your stomach queasy? Do you feel pain, tightness or clenching anywhere? Do you feel hot or cold anywhere? Any numbness? Try to notice everything you feel in your body. On an emotional level, what do you feel most intensely—anxiety, dread, anger, fear? Put all of these together—your emotions and any sensations you feel in your body. How overwhelming does it all feel? Give it a number on a scale of 0 to 10. Take a deep breath and begin by Tapping 3 times on the Karate Chop point. Karate Chop (Repeat 3 times): Even though I feel all this overwhelm in my body, heart, and mind, I love myself and accept how I feel. Collarbone: What if they hate me for it? Take a deep breath, and notice how overwhelmed you feel now when you think about telling your children about the divorce. Give this feeling a rating of 0-10. Has it decreased? Tune into your body and notice any change that’s happened. You may feel you need to keep Tapping in order to get the desired relief. Pay attention to what your mind and body are telling you. 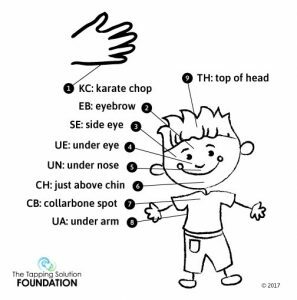 You can download this child-friendly Tapping diagram, along with many other free resources, here. When Kimberly first learned about her parents’ divorce, she had insisted she only wanted to be with her dad. Later, however, she changed her mind, and announced that she only wanted to be with her mom, Deanna. Recognizing Kimberly’s confusion, her mom asked her if she could tap on her one day. When Kimberly nodded yes, she began Tapping through the points on Kimberly while saying, “I really want to be with Mommy” and then, “I really want to be with Daddy,” and later, “I’m so confused. I love Mommy and Daddy!” After a couple of rounds, Kimberly nodded, acknowledging the confusion that she was feeling. A couple of weeks later, Dad came to visit and to pick her up. Overwhelmed by his presence, Kimberly initially threw a fit, exclaiming that she didn’t want to leave her mommy. Deanna quietly accompanied Kimberly to her bedroom, telling her ex that they’d quickly finish getting ready. In the privacy of Kimberly’s room, Deanna asked her if she could tap on her. Kimberly nodded yes. Deanna then began Tapping through the points on Kimberly as she voiced her daughter’s confusion again. This time, she tailored her Tapping to what was happening at that moment, using phrases like “I really want to stay with Mommy” and “I also want to go with Daddy.” After one round of Tapping, Kimberly smiled her biggest smile, and ran out of the room toward her father. “I’m ready! Bye, Mom. See you later!” she exclaimed excitedly. I love this story because it’s such a powerful example of how Tapping can cut through the emotional fog and allow kids, as well as parents, to release the emotions they’re feeling. While sharing this story, Deanna, who participated in my Parents Group program, noted that she’d been using Tapping on herself, as well. Tapping had allowed her to be present for her children in challenging moments like these, even though she herself was managing a long list of competing priorities. Since divorce divides Mom and Dad into two different “camps,” younger as well as older children may experience confusion around needing to “choose” a parent. That confusion may also create a tendency to blame one parent more than the other for the divorce. Let’s look at how to use Tapping to work through that confusion. Reminder: Be sure to do your own Tapping first, since it’s important to respect and honor how your child is feeling, even when their emotions are upsetting to you. Have your child rate his/her confusion on a scale of 0 to 10, or using the “this much” method of measurement. 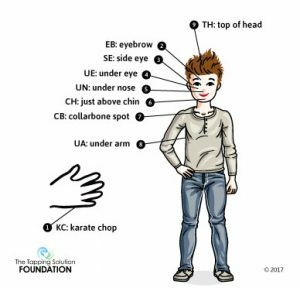 If your child is not yet able to understand the concept of a 0 to 10 scale, the “this much” method of measurement can be done by extending their arms wide apart, showing their feeling with how far apart their arms are. They can hold their arms far apart to show strong emotion, and closer together to show less severity of the emotion. Karate Chop (Repeat 3 times): Even though I feel confused about the divorce and feel like I need to choose between Mommy and Daddy, I’m a great kid and I’m okay. Have your child take a deep breath and then measure his/her confusion once again. Keep Tapping until s/he gets the desired relief. If your child is angry and blames you or your ex-spouse for the divorce, ground yourself by Tapping on your own emotional reactions first. When you’re ready, have your child rate his/her anger and blame, either on a scale of 0 to 10 or using the “this much” method of measurement. Take a breath and then begin by Tapping 3 times on the Karate Chop point. Karate Chop (Repeat 3 times): Even though I’m so angry about the divorce, it’s all your fault, and I refuse to forgive you, I’m a great kid and I’m okay. Take a deep breath and have your child rate the intensity of his/her anger and blame now. Keep Tapping until s/he gets the desired relief. If other emotions arise while Tapping, tap on releasing those as well. Can I use Tapping for…? In The Tapping Solution for Parents, Children and Teenagers you can learn more about Tapping for divorce, specifically around anger, sadness, adjusting to a new home, releasing self-blame, accepting a new partner, and more. You can also read how Tapping can be used for many needs, such as anxiety, impulsivity, social concerns, and MANY more! 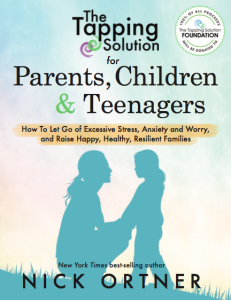 Whether your child is managing emotions surrounding your divorce, or you’d like to prepare yourself before talking with your child, this book will support you in understanding your role and providing specific tools to encourage healthy processing of this difficult time. The best part is that with every purchase of this book, 100% of the proceeds, in perpetuity, will be donated to The Tapping Solution Foundation to continue bringing free EFT Tapping resources to schools and families, and providing trauma relief around the world. This is a great article and gives practical tips on what to say as well as how to tap with kids around this difficult issue of divorce. I am a counselor and use tapping with my pre-teens and teens in session and as homework. I appreciate how Nick laid this out. Some of the kids of divorce have serious anxiety and tapping has helped them to regulate their thoughts and feelings. Hi, Sheri! I’m glad you find this article useful. Thank you for the important work you do! All my best.